It may come as a surprise to some, but the 1662 Book of Common Prayer has not remained utterly constant over the years. Besides the obvious changes in the prayers for the King or Queen and their families, a number of other relatively small changes have been made in the past 300+ years. Rubrics have been changed, some services were dropped, the lectionary revised, and even the title was changed for a time. The changes are interesting not only in themselves, but also because they can serve to help date a Prayer Book which has no printed date of publication; Books of Common Prayer printed since about 1860 are undated. Sources for the variations in the State Prayers came primarily from The State Prayers and other Variations in the Book of Common Prayer, by Frank Streatfeild (1950) and also from David Griffiths' Bibliography of the Book of Common Prayer (2002). The basic source for most of the other changes was Lynda Howell's excellent and comprehensive 1662 BCP site. Additional information on the variations came from a number of sources, including prayer books in the author's possession, Blunt's Annotated Book of Common Prayer (1866), a report from the Convocation of York, Deviations of Modern Editions of the Prayer Book from the Text of the Sealed Books (1891), Procter & Frere's New History of the Book of Common Prayer, and Percy Dearmer's Everyman's History of the Prayer Book (1912). Not all of this information is complete; if you have knowledge of additional changes, or can narrow down the dates or nature of the changes better than I have been able to, I'd love to hear it. The State Prayers as they originally appeared, from an edition printed in 1666. The "State Prayers" in the 1662 Book of Common Prayer appear towards the end of both Morning Prayer and Evening Prayer. There are two: "A Prayer for the King's Majesty" (or Queen's, as the case may be), and "A Prayer for the Royal Family". Shorter forms of these prayers can also be found in the Litany; the King (or Queen) is also mentioned by name in a number of other places in the Prayer Book. 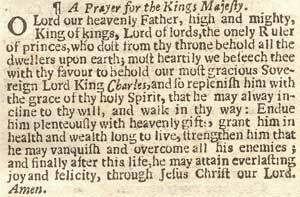 Prayer for the King, from an edition printed by Baskerville in 1760. Prayer for the Royal Family, as printed by Baskerville in 1760. How one person dealt with the changing monarchs (from an 1810 book). Prayer for the Royal Family, from an illustrated Book of Common Prayer of the 1860's. Prayer for the Queen, from about 1960. Prayer for the Royal Family, from a Book of Common Prayer printed about 1960. Following the calendar reform of 1751, the Calendar section of the Book was changed starting in 1752, with additional Tables for Finding Easter also added. Sometime, apparently in the 18th century, the Table of Kindred and Affinity was added, without authorization. It was changed significantly in 1949, and then again in 1986 (I'm not certain about these dates, but they should be close). The original, 1949, and current versions are all online. From 1801 - 1871, the title of the Book of Common Prayer referred to "the United Church of England and Ireland"; otherwise it is "the Church of England"
Also in 1801 the word "Dominions" was substituted for "Kingdoms" in the Prayer for Parliament in Prayers and Thanksgivings. The oaths of allegiance and supremacy were removed from the Ordination Services in 1865; however, the Ordinal does not seem to have been commonly included in BCP's until around that time. The Daily Office Lectionary was changed extensively in 1871, and again in 1922. The new introduction (The Order how the rest of Holy Scripture is appointed to be read) from 1871 is considerably longer, containing nine paragraphs; the old had five. All three lectionaries are online. The 1922 Lectionary is optional, so books printed after that date may or may not include it. The Accession Service was significantly revised in 1901 and again slightly in 1910; the current version is online, as is the pre-1901 version. The Act of Uniformity was repealed in 1974, and thus was dropped from the Prayer Book; however, older editions commonly do not include it anyway (or them; some have Elizabeth I's, some Charles II's, some both, most none). A paragraph was added to the introduction to Morning and Evening prayer probably in the 1960's, allowing Lay Readers "and such other lay persons as may be authorised by the Bishop" to lead Morning and Eveining Prayer. Also, a rubric was also added just after the Absolution directing that the Collect for the Twenty-First Sunday after Trinity be read instead of the Absolution, if a Priest was not present. The second and third paragraphs in the introduction to Holy Communion, dealing with the admision of communicants to the Eucharist, was replaced with a single paragraph, sometime in the 1960's. Both old and new versions are online. At the same time there was similarly another unauthorized change in the rubric in the Marriage Service regarding the banns. Previously, the rubric stated that the banns were to be read "three several Sundays or Holy-days, in the time of Divine Service, immediately before the Sentences for the Offertory ..."
The introductory rubrics to the Public Baptism of Infants were extensively revised, sometime in the 1960's or so. Both old and new versions are online. The first introductory rubric in the Private Baptism of Infants, urging prompt baptism of infants, was dropped sometime in the 1960's. The introductory rubrics to the Baptism of those of Riper Years were extensively revised, sometime in the1960's or so. Both old and new versions are online. The introductory rubrics to the Ordinal were changed in 1964. Both old and new versions are online.